Become a Color Run Volunteer! We’re looking for fabulous and fun volunteers to give us a helping hand at The Color Run 2019! Keep your eyes peeled for when we release Volunteer positions. Volunteering at the Happiest 5k on the planet is a great day out and an awesome way to meet other people like yourself, plus you’ll bag yourself a super-cool volunteer t-shirt! You’ll also be looked after with food, drinks and loads of colorful fun. Those that volunteer at the packet-pick up shifts prior to the event are also able to run for FREE on the Sunday! At the conclusion of your shift we will process your registration so no need to purchase your tickets now. Be aware that these shifts fill up quickly! What Colorful fun could I be having? General Helpers: You’ll be helping out where you’ll be needed most on the day. Some of these jobs include helping at the start or finish line, the merch tent, greeting the runners, helping them make their way to the event site, magic making in the village, check in and parking! 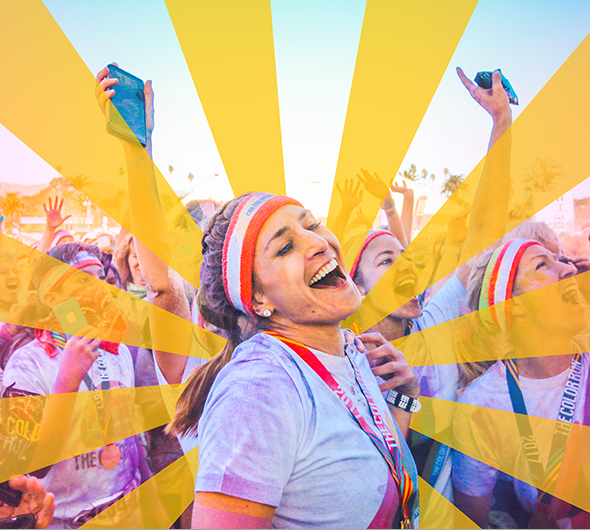 Packet Pick Up: This shift is a fun option available for those who are registered to run the race but would still like to have The Color Run Volunteer experience. You’ll be helping the runners collect their participant pack in the days leading up to the event. Available on Thursday, Friday and Saturday. Color Zone: Maybe the most unique volunteer job in the WORLD!! – Yeah we said it. This job includes throwing powdered “color” at racers as they pass our 4 color stations. You will get really colorful (read: get head to toe fully covered in colored paint powder). You will also be the front line of our cleaning crew. Color Zone Volunteers will work for 30-40 minutes after the last runner passes to sweep and dispose of the excess color and prepare the course to be re-opened to the public. If you can gather up a volunteer group of 25 people, you have a very good chance of getting yourself into a color zone. But act fast, these spots fill up. Sounds great, how do I register? Registration is easy – Simply select the event of your choice from the options below, select your shift and enter your personal details and you’ll be done! You’ll then get more information about the event two weeks before the event date! *PLEASE NOTE: 2019 Volunteer Shifts will be opening soon. Sign up to our VIP List to be the first to find out when shifts become available.